Why Do Centipedes Invade Homes? Some of you may be wondering why you are suddenly seeing centipedes in your home. Similar to many other pests, in the winter, centipedes are looking for a dark, moist, secluded space that offers them a food source to wait out the cold months. Then in the spring and summer when they are most active, they can lay their eggs; and their numbers increase. Of course, none of us want this to happen inside of our homes! How Do Centipedes Get Inside? 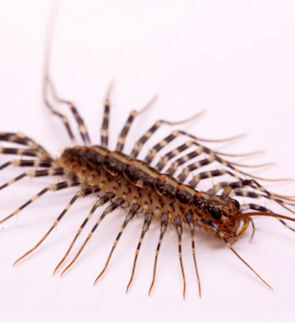 Now that you know why they want to make your home theirs, the next most important question to answer is “how do they get into your house?” Centipedes typically will access your home by sneaking in through cracks and crevices or by climbing up through bathtub drains. Once inside, they will hide in closets, basements, bathrooms, and under kitchen sinks; and that’s just the beginning. Are Centipedes Harmful to Humans? Centipedes look like they just came out of a horror movie. Some varieties can have anywhere from 15 to 177 pair of legs, and typically grow up to one inch long (some species have even been known to be as long as 6”). House centipedes range in color but commonly are grayish yellow and have dark stripes on top. Each segment of their body has a pair of legs. They have hairy antennae they use to detect prey, and have the capability of injecting venom into their prey to immobilize it. This venom, however, is generally not harmful to humans. They feed on insects, worms, and spiders; but they also eat other centipedes dead or alive. Contrary to what some people think, centipedes do not eat wood like millipedes can. Centipedes are nocturnal, are rarely seen by people, and do not leave much of a trace behind that would indicate their existence in your home. When they are found by humans, it’s usually as they scurry along the floor or up a wall. They move really fast and will lift their bodies up to run and will lower it to the ground again when they stop. Regardless of the fact that they are harmless, you don’t want them invading your home! How Can You Avoid Attracting Centipedes? There are a few things you can do to avoid attracting these creepy pests to your home. Indoors, you can remove clutter, caulk and seal any cracks and crevices, and eliminate moisture by using dehumidifiers. Outside, you can deter centipedes by cleaning up junk, compost, wood, and leaf piles. Also be sure to remove standing water, trim around plants, use door sweeps, and install tight-fitting doors and windows. These tips can be helpful, but using a year-round pest control plan from a trusted provider such as Alexandria Pest Services will give you much better and lasting results. When you contact APS about a pest problem, we’ll come to your home, business, or government office to conduct a full inspection. This allows us to pinpoint the pest type and any points of entry or problem areas. If you are experiencing a centipede problem or any other pest control issue, call us at 703-923-0925 to schedule a professional inspection of your home. We will provide recommendations for the corrective measures and solutions to get rid of pests for good!